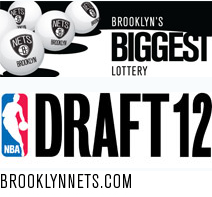 The Nets have a decent chance of winning the Draft lottery via Sporting News. Irina Pavlova, president of Mikhail Prokhorov’s Onexim Sports & Entertainment USA will be at the Lottery to represent the Brooklyn Nets. The Charlotte Bobcats have the best chance to win the top pick. Kentucky’s Anthony Davis will be selected first, no matter to wins the lottery. * This Nets’ pick goes to the Trail Blazers unless it’s in the top three.
! The Hornets have two lottery picks, and thus a 14.8 percent chance to land the top pick. Only the top three picks are determined by the lottery. The rest of the first round will be determined based on record. In other words, the lowest the Bobcats can pick is fourth.